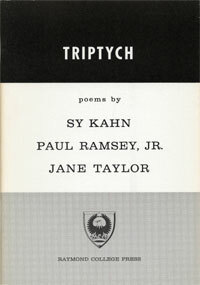 "Landscape with Hagar and the Angel"
The three poets in this book were members of the English Faculty at Raymond College, the University of the Pacific, in Stockton, California. Paul Ramsey was born in 1924 in Atlanta, Georgia. He studied at the University of Chattanooga, the University of North Carolina, and earned his doctorate from the University of Minnesota. Jane Taylor was born in 1939 in Richmond, Virginia. She studied at Bryn Mawr College and the University of North Carolina.